Artist Steve Pitсtelkow speaks about the history of marbling or Ebru, as it was invented by Turks some 600 years ago. This video also shows the main steps of the process and tools used for marbling. However, I should mention that even if Ebru is a Turkish technique, there are other places of origin of similar forms of art. Some of them even are more than a millennium old. Suminagashi (墨流し) – a Japanese way of transferring floating ink to paper is known at least from the 12th century. 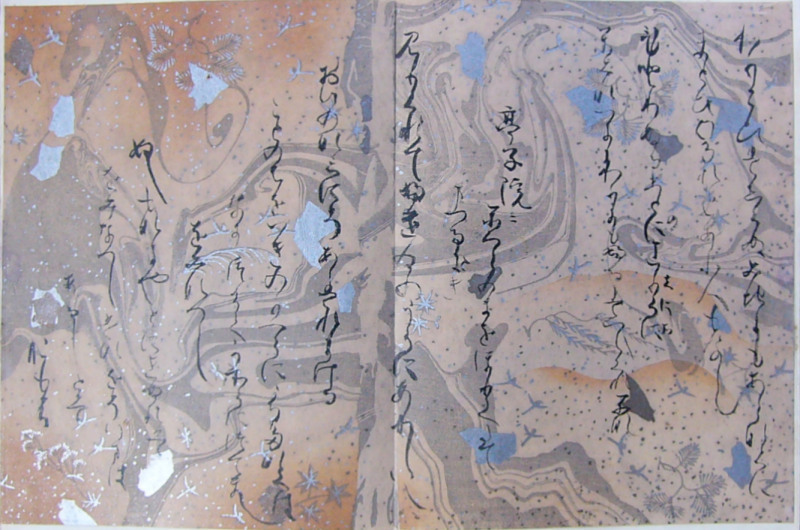 Two pages of waka poems by Ōshikōchi Mitsune (859?–925?). 20 cm height, 32 cm wide. Silver, Gold, Color, and ink on suminagashi paper. From a copy of the Sanjurokunin Kashu or “Thirty-Six Immortal Poets” kept in the Hongan-ji Temple, Kyoto. This multi-volume manuscript, which contains the oldest examples of marbled paper known today, was presented to the Emperor Shirakawa on his sixtieth birthday in 1112 C.E. (Narita, 14 and Chambers, 13–16). There were also similar Chinese techniques dating back a far as the 10th century or even earlier.